Silver-Lined Siam Ruby Bugle Size 1 Seed Bead.These bugle seed beads are 3mm in length and come in a lovely ruby colour with a silver-lining. 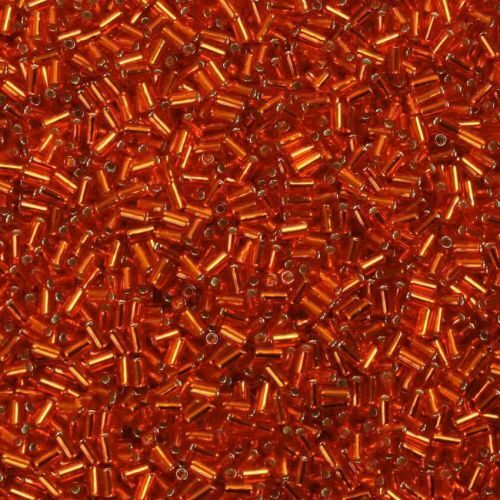 These Japanese made Toho beads are excellent quality and are known for being consistent in their size and colour. These are size 1 bugle beads. Each bead measures approx. 3mm. CommentOoh these are just gorgeous! CommentReally hard to find quality bugle beads with precision cut ends. Most are wonky and jagged and are hard to work with. These are perfect! Very happy with them and will definitely be buying more.